For reservation dates Completed by May 3, 2019. Pay for 2 Nights, get 3rd Night FREE (for NEW Bookings ONLY!!!). Only one night free per stay. Offer not valid on existing reservations, weekends, or during holidays. This LUXURY LOG CABIN SLEEPS 12 People. This prestigious cabin is a great ENTERTAINMENT VALUE. In this LUXURY 4-BEDROOM CABIN (each bedroom has its own FULL bath), plus the MASTER BEDROOM has a NEW 50 INCH HDTV with DVD Player and Satellite TV. There are 32 Inch HDTVs and DVD players in the other 3 BEDROOMS!! That is in ADDITION to the 50 Inch HDTV in the Game Room with DVD and Satellite TV, and Surround Sound System, and a 60 Inch HDTV in the Living Room with a Blu-Ray Player with Surround Sound System, and Satellite TV. A GREAT ENTERTAINMENT VALUE with 175+ DVD Movies!!! New X-BOX ONE game system, along with two (2) VIDEO ARCADE GAMEs in the Game Room ....complete with FREE-PLAY MULTI-PLAYER 100 GAME VIDEO ARCADE GAMING SYSTEMS. Mini-Wood Cabin Playhouse for the KIDS. With so much to do in Cabin you will just want to stay at the Cabin, which will SAVE you from spending a lot of $$$$$ in town. A great entertainment value!!! Get Cozy and Snuggle Up to either the 50' HDTV in the Game Room with Surround Sound or the 60' HDTV with Surround Sound in the Living Room and watch some of the 175+ DVD Movies in this CABIN FOR YOUR VIEWING PLEASURE with a bowl of POPCORN....or get warmed up in the HOT TUB with a beautiful mountain view while you sip a glass of wine or favorite beverage. Or just swing or rock while relaxing on one of the 2 outdoor decks! The BEST ENTERTAINMENT VALUE in a CABIN in the Popular GATED BEAR CREEK CROSSING RESORT!!! It is one of the MOST BOOKED....AND THAT IS FOR A REASON!!!!! This LUXURY LOG CABIN is the BEST ENTERTAINMENT VALUE with a GREAT MOUNTAIN VIEW!!! THIS LOG HOME/CHALET SLEEPS 12 people and has a Common Area complete with INDOOR & OUTDOOR POOLS, and FREE MINI-GOLF all near a WATERFALL, there is a PRIVATE HOT TUB at the Cabin with a Great Mountain View. There are Two 100-Game Video Arcade Game Systems with FREE PLAY to keep the kids busy for hours, like a mini Video Arcade and with over 175 DVD movies the cabin is like a mini-Blockbuster. In addition, there are books, toys, board games, a new Custom Handmade Rustic Wooden Pool Table, FREE 'Wi-Fi' Internet, and a huge Master Bedroom Suite, and three other KING BED SUITES, all with different decor. This cabin was designed to keep the kids busy so you don't go broke in town. There are 3 Levels with 2 Outdoor Decks and an Outdoor Hot Tub, 2 BBQ grills, a Swing and several Country Porch Rocking Chairs. Professionally decorated. EXCELLENT MOUNTAIN VIEW!!! HUGE MASTER BEDROOM with Bedside Jacuzzi, Huge Master Bath with double vanity His-and-Her sink and ceiling fan in Large Bathroom. Great for a Honeymoon/Anniversary Suite. 4 King-Size Suites each with there own HDTV and Private Full-Bath and King-Size pillow top bed & closets. There is a 1/2 Bath off of the FULLY EQUIPPED KITCHEN with LARGE COUNTRY TABLE that SEATS 10 PERFECT for the HOLIDAYS and any Family Vacation or Get Together. This Luxury 4-Bedroom Log Cabin is lOCATED IN THE GATED BEAR CREEK CROSSING complete with a common area indoor pool, outdoor pool and free mini-golf!! BEST PRICED CABIN in the area with the MOST AMENITIES in the RESORT for the price!!! Compare the prices of this well equipped cabin full of many extras to other comparable cabin in this Luxury Gated Resort. WASHER/DRYER included....and everything to make you comfy and cozy so you feel at home!!! YOU WON'T BE DISAPPOINTED!!!!!!!! WOW....best deal for a 4-Bedroom Log Cabin in the GATED RESORT of Bear Creek Crossing and a cabin that has so many amenities! VIEW VIEW VIEW!! What more can we say... We loved the mountain view and yet how close we were to 441 and all the activities of Dollywood, the dinner theaters, amusement parks and yes...TANGER OUTLET MALL. We are so close (stop light 13.1 by Tanger Outlet Mall between Red Lobster and Olive Garden) but far enough to get away from the crowds of Pigeon Forge and Gatlinburg. Plus a hop skip and a jump to Smoky Mountain National Park where we love the outdoors, hiking and the beauty of nature. Plus, Bear Creek Crossing is the nicest of all the resorts with FREE MINI GOLF and an indoor and outdoor pool with a beautiful waterfall. We found the perfect spot to call home. We've supplied tons of Extras in our log cabin home including water noodles, over 175 DVDs for all ages, books, toys, cards, board games for a GREAT ENTERTAINMENT VALUE! We know it can get expensive in town so we made our cabin a complete entertainment value in itself!!! YOU WILL ENJOY THE CABIN!! Owned and operated by Mountain and Oceanfront Properties - John and Dee Bartleman. LOCATION LOCATION LOCATION! It's our relaxing nature escape away from the real world..... We purchased this property because it's in a gated resort with a beautiful view close to all the Pigeon Forge and Gatlinburg activities and the Smoky Mountains. It's a large cabin with tons of extras that other cabins don't have. A view, hot tub, 2 arcades, FREE POPCORN Machine, Play house, HDTV's in ALL rooms, 200 DVD's, Surround Sound throughout, 2 two to 4 person Arcades. THE GREAT ENTERTAINMENT VALUE and LOWEST COST for a 4 BEDROOM CABIN in the GATED BEAR CREEK CROSSING RESORT. NOT ONLY DOES the RESORT AREA HAVE INDOOR & OUTDOOR POOL and WATERFALL, it is UNIQUE in that it has FREE MINI GOLF with a beautiful waterfall!!! Dog friendly with an EXTRA $100 non-refundable pet cleaning fee ONLY IF ARRANGED IN ADVANCE!!! toilet, shower, jetted tub, Huge Master bath w double vanity sink as large as a bedroom! NEW 50 inch HDTV IN MASTER PLUS DVD AND 32 INCH HDTV's WITH SATELLITE AND DVD PLAYERS IN ALL BEDROOMS for your entertainment pleasure. Satellite HDTV's in some bedrooms, 50 inch in Master, 60 inch in livingroom, 50 inch in game room and DVD's in EVERY BEDROOM!!! OVER 175 DVD'S STOCKED IN CABIN FOR ALL AGES. JUST LIKE A Mini-BLOCKBUSTER!!!!!! 2 WRAP AROUND DECKS ON 2 LEVELS WITH SWING, 8 rockers, 2 NEW Birch rockers AND NEW WOOD MINI CABIN PLAY HOUSE FOR THE KIDS!!!!! Enjoyed our stay. Definitely a mountain top view. Called maintenance for help with tv and he was there almost immediately. Fixed it. Very nice and pleasant to talk with. Carpet in bedroom on main floor could use cleaning. Photos are misleading. Many items were broken. Communications with the owner and its property contacts are not up to date. We called the maintenance number the first night to help get gas for grill, to look at an out of order washer, broken eye on stove, and sink leaks. (Only 2 towels are given to the bathrooms, so a washer is needed) The lady answered and said she hasn't worked for the cabin in 5 years! We did get help that next day and the man was very nice and helpful. He gave us 2 gas tanks and cleaned the grill. He told us to put down towels to keep the washer from leaking onto carpet and the eye on stove just don't use it. The cabin itself is nice size for our 8 adults and 4 children ages 5 and under. The kitchen has many cooking items, only needs a skillet, it has everything else. 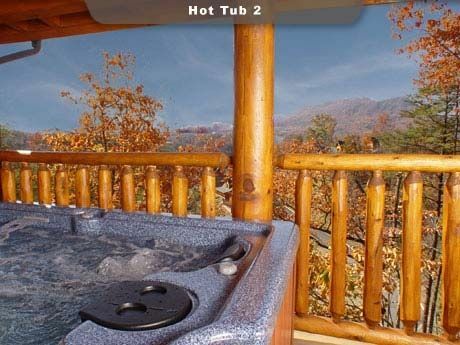 The hot tub was wonderful with a view of mountains. The mini golf and pools are close for a short drive. The drive to town is a very curvy road. We went during shades of the past and we were able to go out to eat and shop without waiting hours. Overall if we didn't have to call so many different numbers to get answers, it wouldn't have been so stressful. Cabin needs some appliance replacements and communication needs lots of work. It was a nice place. There was a musty smell in the lower level. The bedrooms were great. It is quite a hike to the pool so we drove. It had all the cooking supplies we needed which was nice. Great view from the upper deck and the hot tub. Snuggle up for movie night and watch one of 175 DVD's stocked in our cabin, plus you can enjoy FREE popcorn with our professional popcorn maker!!! The best entertainment value around. 2 VIDEO ARCADE GAMES, TOYS, BOOKS, HOT TUB, INDOOR and OUTDOOR POOL, FREE MINI-GOLF, POOL TABLE and much more! Rates are subject to change. A RESERVATION IS NOT MADE UNTIL PAYMENT and Rental AGREEMENT is SIGNED and RECEIVED. We accept DISCOVER, MASTER CARD, and VISA credit cards with a 3% processing fee; and you can pay by PAYPAL as well. NEVER Wire Funds or provide your bank account information to ANYONE when renting a property (we do not need such info., nor do we require it). Additional fees may apply when payments are made using credits cards or eChecks through the VRBO/HomeAway system.